Today and yesterday were wet on and off, wind and rain, horrid inside and out. It would have been fine inside as the house is warm without being heated due to the insulation being so very good. However we were engaged in a mammoth circulation of our possessions to clear space for a plasterer to mend the hole where Matt, the builder’s labourer, fell through the ceiling. Having established that he didn’t need an ambulance I considered finishing the job and kicking him through to down stairs but relented. After all there’s nothing about a load of fibreglass, muck, plaster and sawdust on your bed to make one upset, is there? The problem with bad builders is they are bad in so many different ways. By the time Matt went through the ceiling I was ready to believe he had done it deliberately. I was aware by this stage that the owner of the company was not asking us for money in a sensible systematic way and then panicking that he didn’t have money to cover wages and asking for it at short notice and then if it wasn’t obtainable in time blaming us for the short wages that I am sure the men suffered from time to time. We also need the new cupboards plastering so nothing can be stored there, the hall and landing need painting shortly so nothing can stay there, our new bedroom needs the floor sanding so…sorry where is all this going …in the studio?…and you think I will be able to use a press in there and work round it all?…ah yes I could throw it all away but….I don’t really want to. There is a view upheld by tutors at college that an artist collects and that this somehow vindicates their body of work. They were encouraging collection in other words, I cannot imagine being in a position where I needed encouraging hoarding, sorry collecting things, it is a great failing of mine, but I am not sure that it makes one artistic. At one point I came to the baskets where my best jumpers were stored and the woolly walking socks for Christmas stockings. These had been fine at Christmas but since then some devastating American form of clothes moth had got in and gone through a shawl that was so fine I had not known it was wool and all the jumpers were full of gaping holes. I thought the socks looked rescueable and microwaved them to kill any living creature…how was I to know they weren’t 100% ? After less than two minutes small patches were turning into melted black ooze and smelling utterly dreadful. I am not popular with anyone. After extensive airing and cleaning the smell is still lingering in draws and cupboards. The community orchard apples have been to West Dean (with someone else) and back and some of the identifications agree with ones we got by using an online key…Carlyle Codlin and Laxtons Reward. One each to DIY Dad and I. We are in disagreement with the experts on a number of other apples but I think I have one of the pears; Packhams Triumph is an Australian pear but was planted in the UK. It makes a decent crumble and I suspect it would juice rather well and eat well later on. 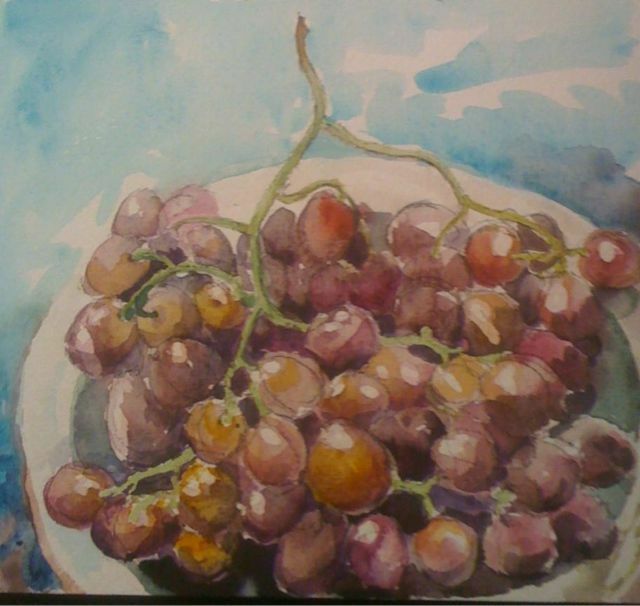 The grapes came from the market and once the boys had recovered from the shock of” PIPS! ?” they disappeared very fast. I also insisted that we picked the cooking apple tree today as the wind was starting to knock the apples off in bulk. No1 and No2 son refused to put on their shoes for a long time until harsh words and threats got them outside. Before we had finished it began to rain and still we picked. In the end No2 was enjoying the rain and being up a tree until me on the ladder and him in the branches were getting along famously. We have nearly cleared the tree and have a giant stack of apples which now need sorting and wrapping for storage in the shed. I think I will get about five trays of top quality apples and plenty for now and then some for juicing. The best part of today was visiting a lovely open studio in a village with old friends. There were paintings, sculptures/cabinets and quilts which were really restoring, the artist Heather told me she had planned for a year to make it all work well. Her studio looks over their garden to the Downs.